Even though the Hawks passed on Chris Paul and Mike Conley, I think they are pretty happy with the Bibby trade. Even better....they didn't have to get up any of their core! (Josh Smith, Joe Johnson, Al Horford). Look for this squad to make a run at a playoff spot. (currently one game out). 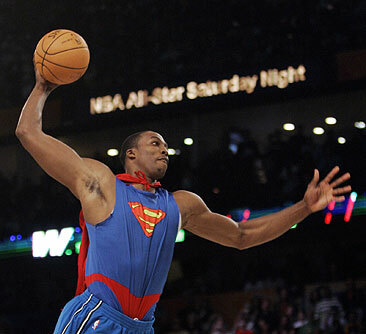 So what the superman "dunk wasn't a dunk! That SH** was amazing! Let me see you jump so high in the air you can look down at the rim and throw a basketball straight threw it! Howard is an amazing athlete and he is only going to get better. I refuse to talk about the steroids SH** because I just really don't care. It has absolutely no affect on my passion for baseball. Orlando @ Detroit 7:30 PM EST (Can Orlando keep pace with the steady Pistons)? This page contains a single article from February 19, 2008 9:47 AM. The previous days article was Home of Greggy G's return to ATS Brilliance.